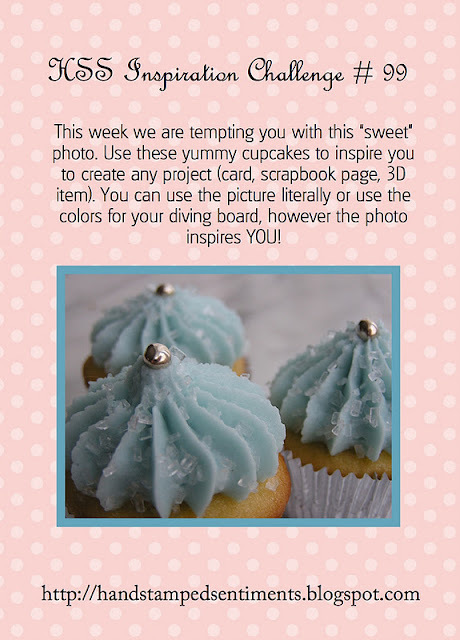 This week on HSS we have an Inspiration Challenge. Cupcakes! I’ve been wanting to make this cupcake box and this was the perfect time to do it. I have a couple of gifts to make so these were perfect. I got the tutorial for the box from Becky Roberts. The actual cupcake box is made with the retired Table Setting die. The instructions for making the box can be found on Patty Bennett’s blog. So much fun to make! Hop on over to HSS and be inspired by our talented design team and join us! Accessories:Big Shot, non- Stampin’ Up! Sizzix Texturz Starter kit Polka Daisies for lid of box, retired Perfect Setting die, retired Early Espresso Grosgrain striped ribbon, Very Vanilla Ribbon, Bashful Blue satin ribbon, Bright Button collection, 8 mm pearl, non- Stampin’ Up! cupcake insert. This is adorable! I love your project. all I can say is WOW Genevieve, that box and cupcake are AMAZING!! Lovin’ the ribbon frosting! This is amazing! I just love it! I need to try to make a cupcake like this!